Taurus "The Golden Bull (Kingyuukyuu)"
Celestial spirit contracted to Lucy. 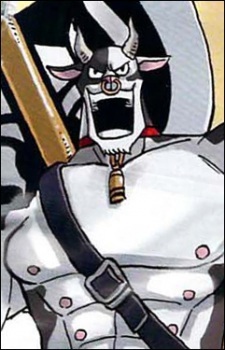 Appears as a black and white minotaur wearing a speedo. Uses a double headed ax for a weapon. He also is a pervert who has a crush on Lucy. Lucy Heartfilia is a celestial wizard, meaning she can summon spirits from the celestial world by using celestial spirit gate keys. These Keys are divided into two classes: common silver keys and rare gold keys. Let's look closer into the golden celestial keys of Fairy Tail.